Store fronts for The Italian Store and Taylor Gourmet. Middle, Roma Sandwich from the Italian Store. Bottom, Philadelphia Landfill Sandwich from Taylor Gourmet. 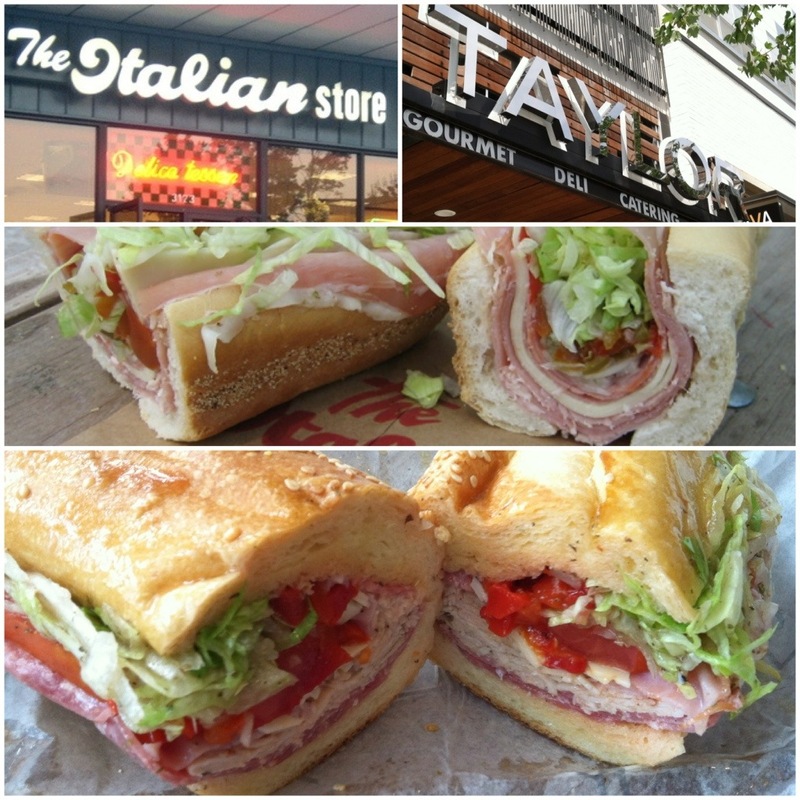 Recently, I tried an italian sandwich at Taylor Gourmet at the Mosaic District in Merrifield, VA. My partner and I got into a discussion on which italian-style sandwich was better; Taylor Gourmet or The Italian Store in Arlington, VA. Italian Store is an institution. Ask any Northern Virginian and they know. It has been around since the 80s and the long lines of devoted customers to get sandwiches proves that. Taylor has come on the DC food scene recently and has various locations in downtown DC, Virginia and Maryland. Yummy bread. Nice and crusty. It is not too hard and not too soft. Holds the dressing well so the bread does not become soggy. Big plus for me! Rolls come in sesame and wheat. Great choices. I think the Italian Stores bread is a little too soft and the hard rips the roof of my mouth. The Provolone Cheese. It is nice and sharp. Has a great bite to it and compliments the flavors of the sandwich really well. Variety! There is close to 40 sandwich choices. The Italian Store has its six standard hoagies you can get other kinds of sandwiches as well. I love that I can get roasted peppers on my sandwich. It was on the Philadelphia Landfill that I ordered. Delicious! I don’t have to pay extra for tomatoes. That is a standard item on any sandwich. I can actually get my sandwich quickly and sit and eat at their shop. Plenty of tables. There is only a few tables outside of the Italian Store and no seating inside. You can spend 30 minutes or more waiting for your number to be called to have your sandwich made and pay. Especially during Redskins’ Sundays. The special dressing is tastier. Hands down. It has a nice blend of olive oil, vinegar and spices. Taylor’s dressing was a bit light. The sandwich makers: I love watching the people behind the counter make my sandwich in front of me. They have a skill they have perfected by folding the meat tightly around the lettuce, tomatoes and onions so everything does not fall out when you eat it.